The fifth section has no title. In it he finds that just as "the librarians of Babel in Borges story, who are looking for the book that will provide them with the key to all the others, we oscillate between the illusions of perfection and the vertigo of the unattainable. In the name of completeness, we would like to believe that a unique order exists that would enable us to accede to knowledge all in one go; in the name of the unattainable, we would like to think that order and disorder are in fact the same word, denoting mere chance." Perhaps so, but I doubt it. Perec is posing a pseudo-problem, as he believes that bookshelves "should serve from time to time as joggers of the memory, as cat rests and as lumber-rooms." Furthermore, he also thinks that "disorder in a library is not serious in itself; it ranks with 'Which drawer did I put my socks in?'" The problem of order in a public library belongs to a higher and more serious order. The same holds for our notes of these books, unless they are kept in the books of the personal library itself which I do not consider a good idea. 1. Georges Perec, Species of Spaces and Other Pieces (New York: Penguin, 1997), pp. 148-155. These sentiments sir a chord in me. In some ways, my situation is worse, as my universe is dispersed in three places: the office, the loft in Boston, and in Indiana. I have been trying to give away books I no longer "need," but it's difficult. From the Notational Velocity Website: "To make good use of NV, try to maintain one detail/fact/item per note. Notational Velocity's strength, note-filtering, is diminished when only a few notes contain most of the content in the database." This advice holds for outline headings and hierarchical note-taking application (or even paragraphs). Try it. It's amazing ... and useless. Some people love pencils. Some people think that makes them better people than those who use ballpoints. But some terrible dictators also loved pencils, Stalin was one of them. The Stanford historian Norman Naimark describes the marks left by Stalin's pencil as "greasy" and "thick and pasty." He notes that Stalin edited "virtually every internal document of importance," and the scope of what he considered internal and important was very broad. Editing a biologist's speech for an international conference in 1948, Stalin used an array of colored pencils—red, green, blue—to strip the talk of references to "Soviet" science and "bourgeois" philosophy. He also crossed out an entire page on how science is "class-oriented by its very nature" and wrote in the margin "Ha-ha-ha!!! And what about mathematics? And what about Darwinism?" What follows from this? Absolutely nothing ... and this holds especially for the truth of Nietzsche's so-called "editorial spirit of the modern age". I never heard of Notepad Deluxe before. The reason is probably that I did not care much about Mac Software until about three years ago. The software has seen no updates since May 22, 2005. 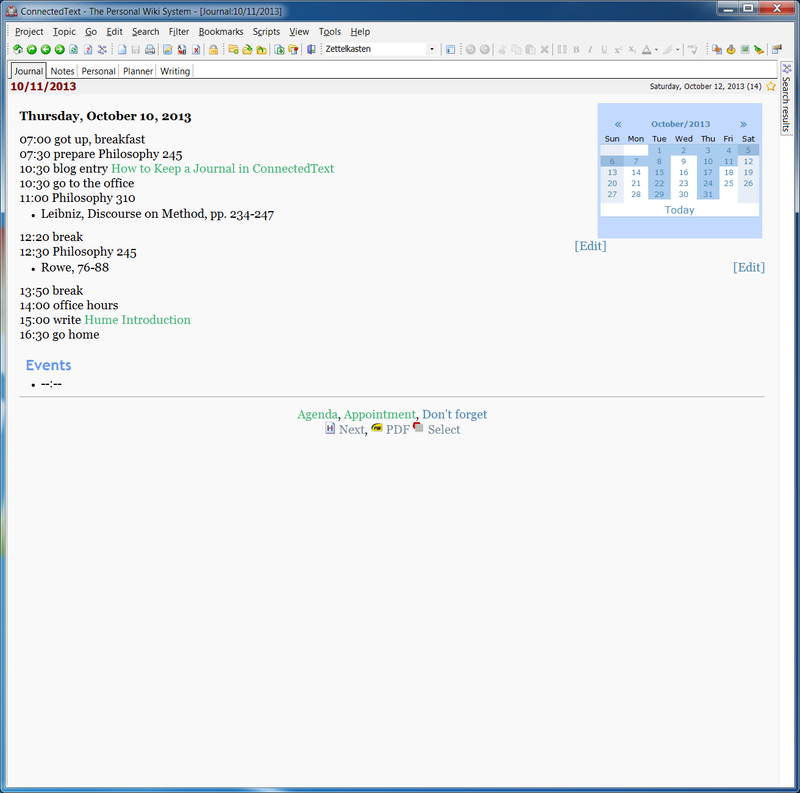 But I recently read Research Journal Tools Reflection: NotePad Deluxe, a post from September 2010 which describes how Michelle A. Hoyle used it for her research. It reminds me very much of Netetab in windows which I still use for an editor. Much of what she says reverberates—especially her main reason for abandoning Notepad Deluxe: "I also wanted to be able to insert a link to previous work appearing in the notes database. NotePad Deluxe allowed you to insert hyperlinks to websites but there was no mechanism to point to another note from within a note." This is precisely what lead me to adopt desktop wikis in 2003 and ultimately ConnectedText in 2005. She promises that the blog post would be followed by others that outline her search for the best research journal too. As far as I can tell, none of these were ever published. I have recently been asked several times how I use ConnectedText. The answer is that I use it in many ways. Usually, I have at least five projects open. (Perhaps better: I always have at least five projects open.) They are respectively called: Journal, Notes, Personal, Planner, and Writing. They represent different focal points of my life, but they are also interconnected. The journal is perhaps the simplest project. I use it to keep a log to document (for myself) how I spent my day and as a jumping off point for other projects. It consists almost exclusively of date topics, i.e. topics that look like this in the editor: "[]" and like this as topic names: "10/11/2013". You might think that "20131010" is too obscure, but it really isn't. It's just a concatenation of year, month, day and you get used to it very quickly. Using this format makes it easy to address any topic in your journal very easy. I should point out that the log entries are preceded by a space (and thus constitute separate lines without a carriage return). You will also note that there are links to topics in other projects that allow you to go to the precise topic you are (or were) working on. Thus, you have not just a record of when you did what, but can easily navigate to what you were working on. It is possible to have many such topics which automate routine tasks in your journal. This is really it. It's simple, yet it is effective. In fact, it follows the approach of "Do the simplest thing that will do the work." There are no categories, properties, attributes, or any other complications in this project. There could be, but you do not necessarily need them. Sould I want them at some point, I could always introduce them. (I should perhaps add that I have a number Breevy abbreviations that all me to enter the date, etc., but this is not really part of this topic.) 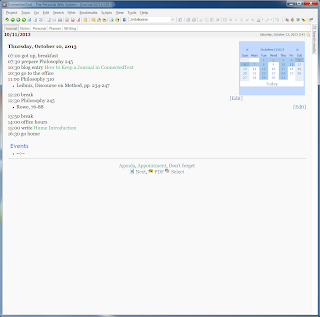 Negotiating to different days in the journal is easy, if you have not disabled "show the calendar in view mode" in options. So, if you want to keep a journal, ConnectedText will allow you to do it in style. And if you don't know how to use ConnectedText, you might want to keep a journal or day book in this way. 1. Does my journal contain other observations, thoughts, reflections? Of course, it does. But I will not share this. The same goes for for properties, etc. Markbox is " a lightweight Markdown-on-Dropbox blog publishing platform." It's in beta. You can sign up. I reported some time ago that I had bought the English translation of Leopardi's Zibaldone. I have read many pages, but have come to the conclusion that it does not live up to its reputation. Most of the stuff in it is about philological details that might be of interest to a few specialists and historical details of interest to no one I know. He does have his moments. But many of those can be found in the shorter selection from the Zibaldone published by a friend from a selection of materials made by Leopardi himself. It whetted my appetite. Not only individual men, but the whole human race was and always will be necessarily unhappy. Not only the human race but the whole animal world. Not only animals but all other beings in their way. Not only individuals, but species, genera, realms, spheres, systems, worlds." I am sad to say that this book contributes to my unhappiness — not because of pronouncements like this, but because they are rare pearls of wisdom (or whatever they may be). You have to go through a lot of dross like this: "Can odoratus, which means sweet-smelling and is an adjective in usage, be anything but a participle in origin?" (976). In short, I do not recommend the book any longer. A longish selection would have been much better. The Introduction is not very helpful either. So we are told that Joseph Anton Vogel, "one of Leopardi's teachers ... embodied the tradition of the ars excerpendi, that is the sixteenth- and seventeenth-century techniques of filing and rationally organizing knowledge in catalogues and indexes" influenced Leopardi, but we are not told how precisely. Instead, we hear that the Zibaldone as "a work of absolute writerliness" (xvii), of "the limitless materials of the Zibaldone" (xxi), and of "horizontal tensions, between contiguous thoughts" (xix). 1. This is quoted in a recent review of the book published here. The review is not without hype either, claiming the Zibaldone is "inexhaustible and worthy of endless meditation." This echos the Introduction which also finds it to be "endless," "limitless," absolute," "infinite," etc., etc. Less would have been more—at least more serious! The sentiment itself reminds of the Buddhist conception of "dukkha" or the idea that all existence is necessarily unsatisfactory. In the catalog to the Marbach exhibition on Zettelkästen, we find that Blumenberg himself found it important to note some of the differences between his an Luhmann's Kästen, i.e. that he used index cards and not paper, that he ordered his cards thematically and not numerically, and that both keep an index. I would have preferred a thicker description of these comments. Instead , they talk at length about the metaphor of "communicating with oneself"—not entirely uninteresting, but not as interesting as Blumenberg himself would have been. They note that Blumenberg's card index consisted more of quotations than did Luhmann's. Did he himself comment on that? We do not find out. Too bad! In any case, I don't want to comment on the format of the book, but on the Postscript and especially some information in the section on "The Syncretism of Slip boxes (Zettelkästen)" which describes Blumenberg's "workflow"—I hate that word—and his notes on Luhmann's "Communication with Slip Boxes." Apparently, he first carefully read a text, underlining important passages with a pen and a ruler. In some books he also included an index card with information when he read the book, how far he read it at a time, and when he continued reading it. He also had a notebook in which he noted the titles of books he read in chronological order. Quotes he found especially important he would transcribe to Index cards in the DinA 5 format, that is, the same format Luhmann used. However he used card stock, not paper sleeps, and he often typed the information. Using a stamp with continuous numbers, he would stamp each card as he finished it. Early on he would note that number at the appropriate place in the book itself. In addition to this, he listed every card numerically in separate lists (on separate cards?). Later, he abandoned this kind of meta-documentation. In addition to this, he noted what projects the notes were intended for. Apparently, Blumenberg began his card index at the beginning of the the nineteen-forties. The editors conclude this on the basis of the condition of some of the cards and Blumenberg's own note in his copy of Luhmann's paper. More specifically he put the number "40" besides Luhmann's claim that he had already worked for 26 years on his slip box in 1981 (207). He ended up with 30.000 cards. The cards with quotations he had used were marked by red slashes at the top and by dates (month and year) on the back. When a manuscript was finished, the used cards were put into marked envelopes marked "erl. KK"or or "finished index cards." Apparently the index cards formed "points of crystallization" or "Kristallisationskerne" (210). They often led to one-page manuscripts as an intermediate stage. He dictated many of his texts, having the index cards in front of him. He also noted what he wrote in separate notebooks, thus tracing "input" and "output" (Blumenberg's own terms). Blumenberg had to re-order his cards several times, depending on the purposes he had at a certain time. Luhmann never did. Whether that was an advantage may be doubted because repeated interaction with the material is more likely to stimulate revisions and growth over time. While Luhmann's work often is repetitious and not very elegantly formulated, Blumenberg's work is much more polished. However, both their texts reveal how they were put together, i.e. that they are accretions of more basic units. In some of his later books (and in the posthumous books) this shortcoming has become a virtue because Blumenberg now seems to write in aphorisms. In some sense, he always did. Should anyone be interested, my slip box (in ConnectedText) has only 10.000 items or "topics" (with another 10.000 items in other projects), but I had a much later start. Nor will I ever have as much "output" as either Luhmann or Blumenberg, not to say anything about the importance. 1. The book also contains pictures of the various types of index cards Blumenberg used. The Marbach catalog (see next post) has more illustrations that show how he worked with the cards. ConnectedText version 6 has just been released. There are many new features and improvements. I only list just some of them (in the order of importance for me). Other people will have other preferences. Any topic can now be previewed in a floating window. Any number of floating windows can be open at a time. The content of floating windows cannot be edited in a floating window, however. To do that you need to open it in the main window. This affordance, among other things, makes it easy to compare the topic you are editing with other topics, or to use other topics as a reference. Inline queries can now query projects different from the one to which they belong. This feature makes the integration of different projects even easier. Auto numbering of headings in a topic. This feature makes headings behave even more like items in an outline. Headings can now also be edited, created, moved, promoted and demoted directly in the "Table of Contents View". This new capability makes it even easier to use ConnectedText like a two-pane outliner. Files and folders can be used as outline items. Outline files can now be used as templates. In other words, outlines can be easily converted to a set of headings which can be later on developed in the editor. This way you can work with the outline view to design your content with all tools available for outlining. The content of footnotes is now available as a tooltip window when you hover over the footnote in view mode. Named Blocks which allow you to annotate longer text. This is useful for those who do qualitative analysis (which I don't do). Map Plugin to display a section of the OpenStreetMap project maps or a Google Map of a given size, scale and coordinates. Nodes in the navigator can be removed. Portable Python can now be used. I should perhaps also add that version 6.5 promises even bigger changes. I think it will be a free upgrade for those who buy version 6.0. Needless to say at this point, I like ConnectedText very much and am glad that it is actively developed.